Fuel prices fluctuate. Parts wear down, break over time and need to be replaced. Those are two constant operating costs that every fleet has to manage. But what is paying for those costs? Revenue. And, what is driving revenue growth? Fleet Utilization. Fleet utilization boils down to how often trucks carry full loads compared to how few deadhead miles or less-than-truckload miles each travels. The more trucks are carrying products to customers at their fullest capacity, the more money the company is bringing in. However, there are a number of challenges that companies must navigate to optimize their fleets’ usage. For example, drivers are not the only ones responsible for making sure that orders are completed on time. Recruiters have to ensure that the company is properly staffed. Maintenance supervisors need to track the wear and tear of the fleet to guarantee that the company is operating according to industry safety standards and to reduce emergency repairs, which are costly. And, dispatchers need to plan and map to cut down on inefficient routes and curtail deadhead miles. Not only does utilization require precise detail and planning from the staff, but companies also have to abide by strict safety standards and operating restrictions. While these challenges all factor into how well a business uses its fleet, one of the toughest things to do is measure utilization. Top Line Revenue: Revenue is typically evaluated and expressed on a per vehicle, per-time-frame basis. For example, $N per truck, per week. As you would expect, the higher the value of $N, the better the assessment of the resource’s utilization. It is usually calculated on a per-week or per-month basis. Miles: Miles can be a useful metric for utilization, especially for regional and long-haul carriers. It is also typically expressed on a per vehicle, per-time-frame basis. Revenue and costs are generally positively correlated with length of haul, so the metric might implicitly generate a more balanced perspective than top-line revenue alone. Hours: When mileage isn’t an accurate representation of utilization, sometimes hours can be a sufficient substitute. Similar to revenue and miles, hours are usually tracked on a per-vehicle, per-time basis, and the general consensus is that more is better. Tonnage: This metric tracks the volume or pallet count that is delivered, or it can be expressed as a percentage of vehicle capacity over the time frame. And, again, it is expressed as units per vehicle, per time frame; more is better. Deliveries: This metric is more commonly used by businesses that operate within the final mile. Deliveries are also expressed as a count per vehicle, per-time-frame basis. And, more would be interpreted as better. Calculating the measure as a percentage of some known or required standard might be a useful way to express the deliveries metric. Each of the aforementioned KPIs has pros and cons associated with it. And, while these KPIs have worked in the past, best practices have evolved and helped industry leaders develop a new, more accurate way to measure utilization. Throughput addresses a number of the various shortcomings associated with the other metrics considered above. Throughput isn’t a measurement that is limited to the transportation and logistics industry, but it’s a way for trucking companies to test their fleet utilization. Throughput is defined as Revenue minus Total Variable Cost (TVC). It is a monetary metric, putting it in the same unit of measure as the goal of the organization. In the equation, and specifically relating to trucking, revenue is generated by the sale of a service to move cargo from Point A to Point B. Meanwhile, TVC is the cost incurred by the activity of a production resource—these costs do not exist if the resource is inactive. For example, this would generally be limited to the raw material cost for a manufacturing company. Additional TVCs to consider are driver pay and fuel costs. It’s important to note that fixed and semi-fixed costs are not included in the calculation for Throughput. Much like the other KPIs that measure utilization, Throughput is measured expressed in the context of the resource and time frame. One example would be Throughput per vehicle, per hour. And, again, more is better than less when evaluating performance based on Throughput. Throughput isn’t a straightforward metric. Constraints can be added to the equation that can produce various results depending on the numbers plugged in for revenue and TVC. Knowing all the possible outcomes is vital for producing the optimal utilization numbers. The equation allows for companies to evaluate their utilization and manipulate the circumstances. Carriers working in less-than-truckload will have different TVCs than full truckload carriers, and both of those will have different constraints than businesses operating within the final mile. In addition, companies can use the equation to test the utilization of its fleet across its different lanes. It’s important to remember that this isn’t a one-size-fits-all equation. Different companies have different constraints and each TVC is dependent on the company’s parameters. But, Throughput has proven to be a consistent model to measure utilization. 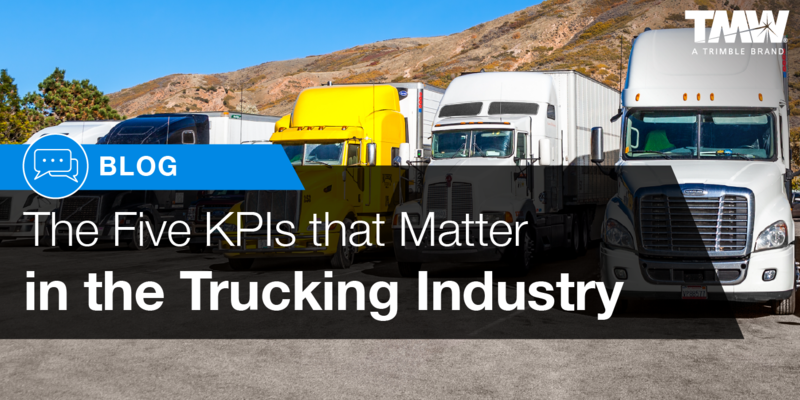 Read TMW’s guide, “Measuring and Maximizing Utilization in Trucking, Stepping Cases for Blockchain,” for more information on the differences between measuring each KPI, and how measuring utilization with Throughput can help advance efficiencies and ultimately boost your company’s bottom line.